Heat oven to 450°F. On lightly floured surface, unroll and stack pie crusts one on top of the other. Roll to 17x12-inch rectangle. Place on ungreased 18x13-inch baking pan. In large bowl, toss asparagus in oil, 1/4 teaspoon of the salt and 1/4 teaspoon of the pepper. Set aside. In medium bowl, stir together mozzarella cheese, cream cheese, 1/2 cup of the Parmesan cheese, the sour cream, garlic, egg, remaining 1/4 teaspoon salt and remaining 1/4 teaspoon pepper. Spread cheese mixture evenly onto pie crust, leaving 1 1/2-inch border around edge. Arrange prosciutto strips on top of cheese mixture. 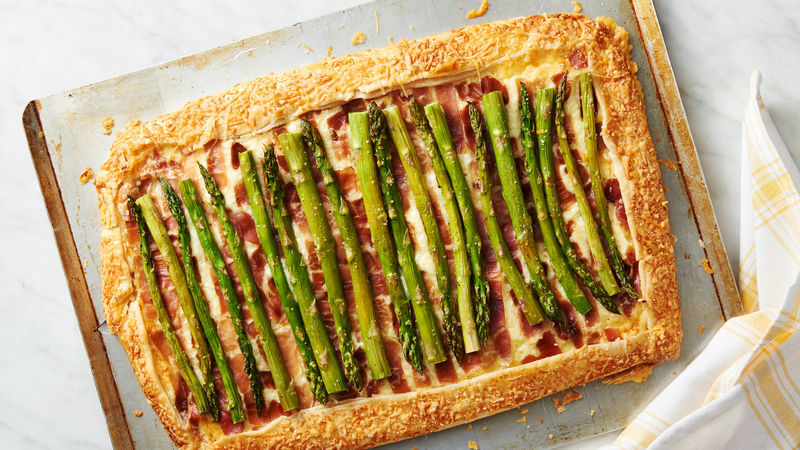 Arrange asparagus, alternating tips to bottoms, on top of prosciutto. Fold edge of pie crust over filling all around, leaving asparagus uncovered. In small bowl, use whisk to beat egg yolk and water. Brush edges of crust with egg yolk mixture, and sprinkle with remaining 3 tablespoons Parmesan cheese. Bake 19 to 24 minutes or until edges are golden brown and asparagus is tender. Cool 15 minutes on pan on cooling rack. This tart, cut into 8 pieces, makes an elegant and light main dish. It can also be cut into 16 smaller pieces and served as an appetizer. To make slicing the thin prosciutto slices easy, make sure to keep the prosciutto chilled before cutting. Brushing edges of pie crust with egg wash and sprinkling with shredded Parmesan cheese gives a lovely decorative appearance to this rustic tart.